Getting BACK into the “Swing” of things! Last week we were cursing this place and today we are rejoicing in its splendor! Thankfully we New Englanders have a short memory when it comes to the weather. So what do we do now? If you are like me, you get out to the range and start to rediscover your golf swing. Maybe you take a lesson, or maybe just work on the fundamentals that are ingrained in your muscle memory. Now, if you have been to the range and have had some challenges, you may be thinking you need some new equipment, maybe the new Calloway Rogue driver for 500$. While new stuff is nice, our ability to score well is more about technique, strength and flexibility. Back problems are very common in golf. Our discs are most vulnerable during rotation which is a big part of the golf swing. However, if we have flexibility in our hips, mid-back and shoulders, there is much less stress/rotational forces on our low back. 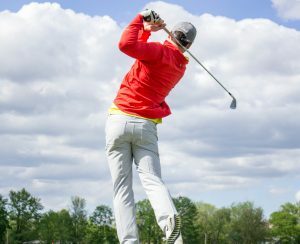 So what can you do to reduce your possibility of injury and possibly add a few yards to your drive? The first step is to find out where your weakness may be. The second step is to correct those weaknesses through specific strength and flexibility work. Anyone can do general stretching and strengthening, even golf specific stuff that can be found on the web; but if you do not know where your weaknesses are you may not be getting the benefits you are looking for. Our first line of analysis focuses on our spine. Fixations in your spinal column will not only reduce your range of motion, but more importantly will put increased stress on the joints above and below – causing more rotational stress on our discs. At our office we perform a specific movement analysis testing both strength and flexibility. We also check each joint of your spine to make sure it is moving in relation to the segments around it and if necessary we take digital x-rays so that we can get a clear picture of the position and condition of your spine. Based on your findings, we will come up with a plan to get your body in shape for the season ahead. If you are an existing patient, a golf specific assessment is an extra benefit of your care, just call Eli and set up a consultation. We will design a plan for you that you can easily do at home. We do use some tools such as foam rollers, crossover symmetry, thera-band tubing and Accumobility balls that are always available for use in our office and for purchase if interested. Let’s make this our best year yet on the links, give us a call today!